After two years of renovation the Grand InterContinental Seoul is proud to announce the complete renovation of many of its prime facilities. Beginning with our 535 guest rooms — including the Club InterContinental rooms — all have been revamped with modern, natural, environmentally-friendly interiors. This renovation project is the largest scale refurbishing the hotel has undergone since it was opened in 1988 to serve as the Seoul Summer Olympics headquarters hotel. The Grand InterContinental Seoul is situated in the heart of Seoul's business and contemporary culture district along with Korea Trade Center, the City Air Terminal, a major department store, casino, duty free shop, movie theater, 200 shops and the COEX InterContinental Seoul. With this prime location the hotel offers easy access, a range of shopping choices and an outstanding environment for business—quite distinctive from other hotels. The hotel's marketing program attracts executives and CEOs working in Seoul's most upscale business district, Gangnam. Differences in marketing concepts create a synergy effect despite the fact that the Grand InterContinental Seoul and the COEX InterContinental Seoul are located in the same world trade center complex. The Grand InterContinental Seoul has rooms which are larger than those of other hotels in Seoul making it the preferred hotel for internatinal business guests. The renovation has added modern interiors finished with natural materials. Guest rooms were designed and renovated by Hirsh Bender Associates (HBA) a world renowned interior design firm. The Club Lounge is located on 26th floor of the Grand InterContinental Seoul. It boasts the best facilities including two meeting rooms, complimentary wireless access as well as non-smoking and smoking areas. A sumptuous breakfast is served in the mornings. Guests can enjoy a delightful variety of canapés, beverages, and special wine of the month in the evenings. The Grand InterContinental Seoul is home to the city's most sophisticated site for international meetings, conventions, and weddings with its Grand Ballroom—capable of accommodating up to 1,000 guests. The remaining 14 banquet rooms have all been refurbished with new carpets, lighting, and interiors creating an elegant and distinctive atmosphere for your event. The Grand Intercontinental Seoul has a total of 13 restaurants and bars that serve modern contemporary cuisines from Italian, Australian, and Mediterranean to Japanese. The buffet restaurant Grand Kitchen is a 280-seat total dining experience. Connected to the buffet restaurant is an equally outstanding bakery shop, Grand Kitchen Deli. The Marco Polo Trade Club, located on the 52nd floor of the Trade Center serves guests not only the finest in Mediterranean and New Asian cuisine but also offers them breathtaking views of southern Seoul. Hunter's Tavern, located on the first floor of the hotel, is hosting special promotion during the World Cup promotion. From June 1 to July 9, 2006 take advantage of a snack buffet highlighted by the sausages and breads from each of the 12 World Cup host cities. A big screen TV makes watching the matches exciting while you enjoy an extended Happy Hour (18:00-21:30). During the World Cup if you order a glass of draft beer, Budweiser, or wine, you'll receive one glass free. 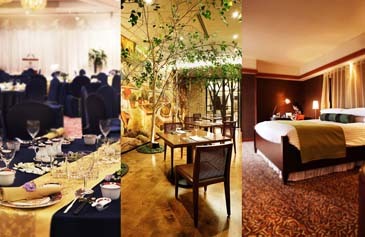 The price of the Happy Hour dinner buffet and one beverage is 30,000 won. (VAT and service charge are not included.) (02) 559-7619.